There has never been a better ‘buyer’s market’ than right now. Call me today to take advantage of the best buying opportunity in many years. Fritz has 19 years of new boat and brokerage experience and has sold on both the west and east coasts of Florida, with clients from around the world. 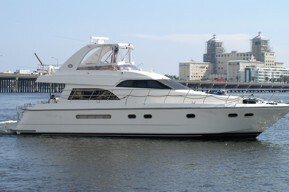 He has sold both recreational and commercial vessels with a focus on the larger powerboat market. Originally from Michigan, Fritz grew up on the water and enjoys all water related activities. He lives with his wife and daughter in Boynton Beach on Florida’s east coast. Fritz is licensed and bonded and is an expert buyer’s broker. He would love to share his knowledge and experience with you to make sure you have the best yachting experience possible. Already done the heavy lifting and found the boat of your dreams but not sure the best way to move forward? Call me, my services are free. I work for you, the buyer. I am paid by the seller. I can find answers most buyers are not privy to - I will put my 19 years experience of negotiating to work for you. With rates at historic lows using somebody else’s money makes sense. Call me to find out who has the best rates and programs to fit your particular situation. Can’t find affordable insurance? Call me. I can direct you to the best companies with the best rates and steer you clear of the ones that don’t measure up. Confused or unsure about Documenting your vessel? Call me. I use the top rated Documentation services in the country. Do you have questions about flagging your vessel offshore? Want to know how it can save you money? Call me. I utilize the services of the best maritime attorneys in the business.